Another Beautiful Day in Paradise. We had beautiful blue skies, temperatures in the high 50s and a slight breeze out of the East. 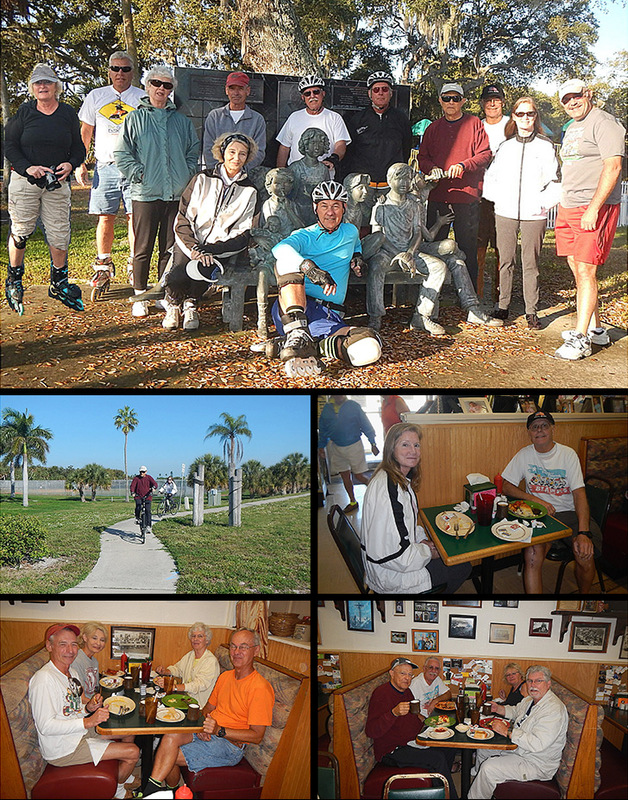 Bladers /Bicyclers Lorraine L, Jim H, Carol J, Bill & Diane S, Dee T, Roy H, Steve G, Bruce M & Dorey Anne, Rob H and Jeff B came. James L missed the group picture. Welcome all. We did the regular Ft. Desoto round trip of about 12.4 miles. There were 8 bicyclers and 4 bladers. Lorraine L and Diane S became new Sponsors today. Thanks for the website support Lorraine and Diane. We Brunched at Munchs just for Jeff today. We got right in and seated at 3 tables. Service was good, the coffee flowed freely and the food great as usual. Dee's table rated their Brunch a 9.5.